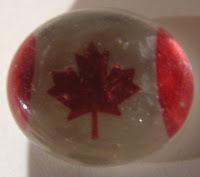 So I got an idea from someone who had made a zipper pull out of a flat-backed glass marble (which I had a bunch of already), and then as I was digging around on the Craftster forums for more inspiration, I found a few different ways to achieve the look. I have come up with a few of my own ideas and wanted to share my preferred method and suggestions on this fantastic (and addicting!) craft. I bet you can't make just one! Please forgive my crappy photographing of this craft - I'm just learning how to use the macro setting on the digital camera successfully with the right lighting, etc. Bear with the bad pics for now, and once I take some better ones, I'll replace these... because these really do not do this project justice at all. You can use other types of clear crafting glue gel instead of Mod Podge, or a hot glue gun instead of super glue. I like Mod Podge because it seals well in addition to being a clear "glue" which is important in this project, and I prefer super glue over a hot glue gun just for less mess and prep, and (in my opinion), more glue control. I tend to have a lot more uncontrollable clumps of glue when using a hot glue gun and I can't stand those long thin strands of sticky hot glue leftovers that get everywhere. Thinner, clearer super glue in a tube seems much more manageable with less mess. And you don't burn your fingers on it! 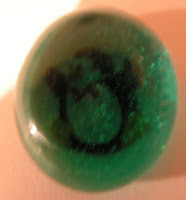 So Where Can You Get Great Images for Your Glass Pieces? Stickers work exceptionally well. They come in tiny sizes and a wide variety of subject matters. 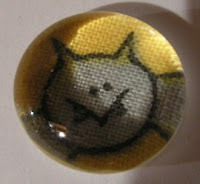 One sheet of tiny stickers can make hundreds of pendants if you find just the right sticker. Good for specific subject designs, and when you apply a sticker to your preferred background paper first, it creates a neat raised effect on the final product. I love using pieces of scrap fabric because it's great if you plan to add a zipper pull to that fabulous new purse you just made. By using a scrap of the fabric you just used in your sewing project, you can create a fantastic matching pull or embellishment that really looks professional. Have a plain bag that has a funky lining fabric? Make the pull out of the lining fabric to bring out the fun in the bag and add a splash of color to the drab exterior. Lace works well because like fabric, it gives a textured look to the image behind the glass. Pieces of decorative scrapbook paper are instant hits with this project because you can find all sorts of designs and colors in various pieces of paper meant for scrapbooking. Good for abstract designs, too. Print them out! The Internet has a plethora of imagery right at your fingertips on any subject. If you can't find something small enough, use free image manipulation software such as GIMP to resize it to fit your needs. This would be a fabulous idea for those who have their own logo or signature icon that they use for their crafty "business", because a printed logo behind glass on a zipper pull or attached to your craft would leave a lasting professional impression on your customers. Products around the house are other locations for inspiration. It sounds funny, but the design on that Kleenex box or the character on that cereal box will look great when made into a glass piece! If these images are on packaging that's too thick or difficult for your project, try scanning them from the product package with your computer scanner and printing them out instead. Check the previous tip on resizing them if they turn out to be too big. And don't forget, there's always magazines and catalogs that are full of designs just waiting to be cut up and made into a new pendant! 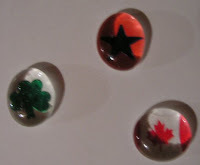 I use a paintbrush and spread the Mod Podge evenly on the back of a flat piece of glass marble, then lay the marble flat side down on top of the image I want to use. I immediately apply pressure to further even out the Mod Podge and seal the image. When that's dry, I'll cut nice and neat around the glass piece for a perfect image fit. I then tend to add another thin layer of mod podge to the back after trimming, especially around the outer edge (being careful not to get on the sides of the glass) to ensure that my image is truly sealed onto the marble. Don't limit yourself to just clear glass - lightly colored glass gives neat hue results. Using felt on the back can help cover up glue gone wrong, wire, or just add a nice soft touch to the finished product. And thin ribbon or fishing line is a nice alternative to nylon cord if you're making pendants, pulls, or ornaments. Have a really abstract or fantastic plain color image to use and want to make it even more interesting? Try baking the glass marbles in your oven in a pan for 45 minutes at 500 degrees F, and then immediately pull them from the oven and dump them into ice cold water to fracture the insides of the marbles. This will add more funk to the finalized look and spruce up a plain colored piece. Be sure to wear protective eye covering when baking and dumping the glass marbles into ice water on this one, just in case! The potential is overwhelming! There's all kinds of great things you can make from this simple craft. Here are a few that I came up with off the top of my head. By applying a little wire that has a loop in it via super glue on the back and adding a jump ring, you've just created a pendant that you can then string up with nylon cord or a chain and voila! Instant necklace that's easy to change as often as your outfits. I also like to use fishing line instead of thick nylon cord for more of an "invisible chain" look. It also doesn't break out my neck like metal does. This idea was my inspiration to look into this craft further, and done similarly to the pendant method. Instead of adding a nylon necklace cord or necklace chain, add a small simple loop chain or thin ribbon that you can attach easily to zippers or sew into your projects. This uses the pendant method, but instead calls for two wire loops on either side of each pendant and uses multiple jump rings to fasten pendants in a row. Once you have a good length that will fit onto your wrist comfortably, add your preferred method of bracelet closures on the end jump rings. I suggest adding a piece of felt or decorative fabric to cover the wire on back side of each piece to make the bracelet look cleaner with less of a raw look when its worn. Other light hues of glass besides just clear also work well in this project. After you've applied the image, add a thin layer of super glue on the back of your sealed glass piece and attach a magnet instead. These make great decorative magnets for your fridge! St. Patrick's Day is coming up, and I found a bunch of tiny shamrock stickers that I applied to white paper and used. 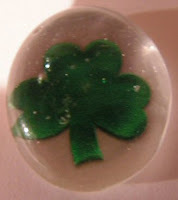 I covered the back with a small piece of green felt to give it a sof t finish, and it sits nicely on desks or in a drawer or pocket and brings good luck to anyone you give them to. You could use any image for this - a heart for love to slip into your loved one's pocket and remind them that you're thinking of them, or even just a smiley face to brighten someone's day. The possibilities are endless when you pick the images, and you can create a great little token to give those around you to suit any occasion. By creating two of these glass pieces that are similar in subject matter or colors and then gluing their flat sides back-to-back with either super glue or hot glue, you can create an ornament! This may require a bit of time since you'll want to make sure you pick out two glass marbles that are similar in size so that the backs line up as best they can. Don't forget to sandwich a loop of thin ribbon in between the two halves before gluing them together so that you can hang your new glass ornament when it's done. I've always wanted to use mosaics to cover the entire top of a little side table or decorative table. With this project, you can create very unique and one-of-a-kind "mosaic pieces" by crafting a bunch of various glass pieces to use as your mosaics. They can be all clear with similar images behind them or different colors with all different kinds of images instead. Once you've made up a couple hundred, you can easily use caulking or a cement paste to affix them in your own artistic arrangement to cover a table top or other item. The possibilities really are endless. I'm sure you'll find other uses for these glass pieces, too. They're really addicting; once you make one, you just want to keep making more. 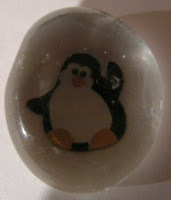 You'll also notice yourself looking for great "glass piece images" on all kinds of things now. It really helps to open up your eyes to all of the great imagery around you! Capture your life and beautiful images with this craft and enjoy all of the various ways you can use them to embellish your surroundings.